This is for the TIO challenge this week the theme"Time Flys". I enjoyed making my tag using a (Lost Coast Designs) rubber stamp, feathers and artistic background paper to set it off. Time does fly when you're having fun making art!! The theme at the Three Muses this week is "Inspirational People", and for me one inspirational person is Frida Kahlo. 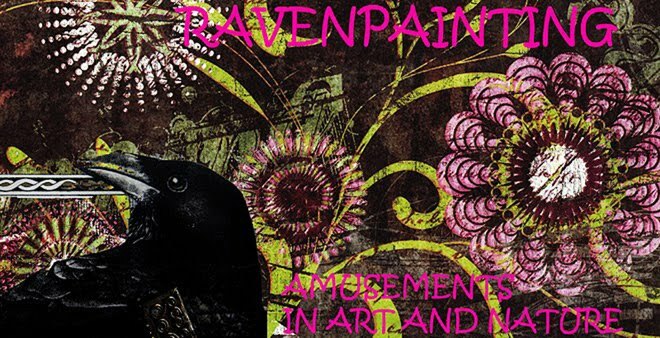 Her inspiration is more than her art; she created many beautiful works but some were disturbing and dark- but all were honest and from her life experiences. I love the fact that she created art from objects around her- sometimes only at arm's length while bed -ridden (resulting in alot of self portraits). 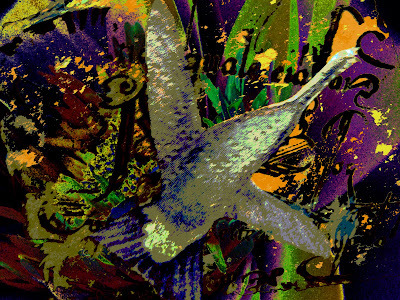 I enjoy that although a consistant theme of her art was based in pain - she always used flowers, birds, and animals to bring life and hope to her work. She was a strong and bold female artist who stood amongst all of the predominantly male artists of her time and she never held back with her work despite strong criticism - truly an artistic warrior! 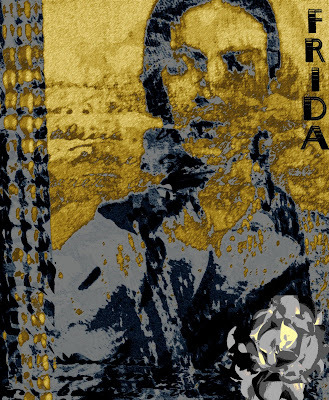 This is a digital collage that I made using a rubber stamped image of Frida (Lost Coast designs) on fabric with mexican trim. I added diary text and a white flower photo from my yard . This is my first entry for the Gothic Arches challenge "Bathing Beauties". The vintage images are from Dover and the artistc papers (background) are from Stampington (Lynn Perrrela) designs. 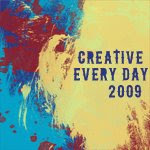 Fun and creative challenge! 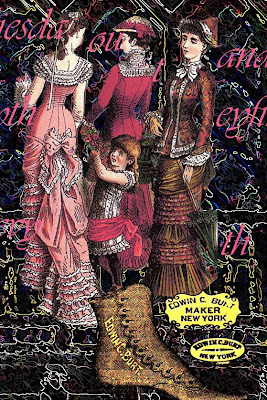 This is my "Fashion" postcard entry for this weeks' Sunday Postcard Art challenge. 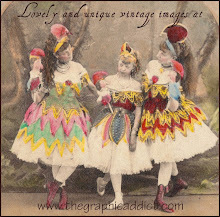 I've been in a vintage mode this week and continued it here with this Victorian digital collage. The background and ladies images are from Dover and the shoe/brand image is from The Graphics Fairy. I had fun painting and altering the background image (storefront and street) with a glowing edges filter and added digital text. I love the very feminine styles of this period (sure wouldn't work today) but at the same time seem so impractical even back then; and most of the high fashion wear we see coming down the runway today (still impractical) - we never see in our daily lives- but it can be enjoyed from an artistic perspective that is both creative and evocative. 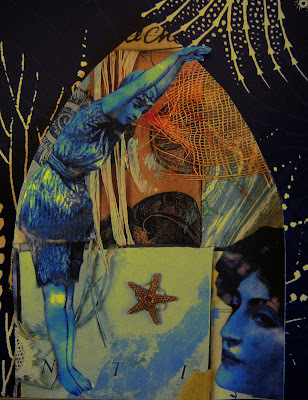 I have really wanted to do an Island collage for a while now so thanks to Ann at The Three Muses Challenge (Incredible Journey this week) I had a chance to. 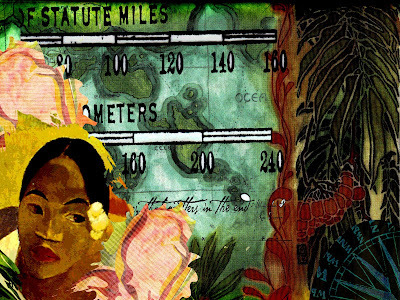 This is a digital collage made from Dover images, Magenta papers and an added vintage travel scale and compass. I cropped an added some florals from tissue paper. Aloha! A word about digital art- love it! Okay that's two words but I have only been at this for four months now (got Photoshop Elements in March of this year) and I have discovered ways to make old things new again! 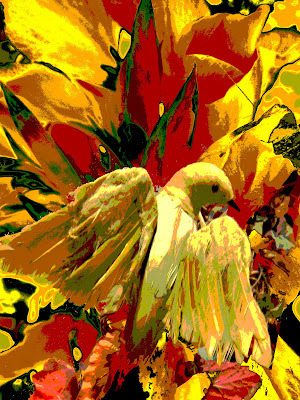 The two digital collages above were made for the Rosie and Linda's Big Art Adventure " A Bird in Hand" being the theme. Both pieces were made from photos that I have taken of flowers from my yard and the birds are silk decorative pieces that I have used in centerpiece arrangements and what- not around the house. "Nothing special "pictures but by erasing out their background , blending them with the floral photos as the first layer and "painting" (for quite some time to get it right) in Photoshop with artistic filters and layers- I came up with two whole new works. Artistic recycling! 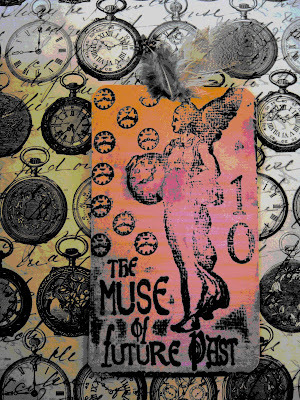 This is an ATC made from a stamped hand tag I made. This is for TMTA "The Moon". 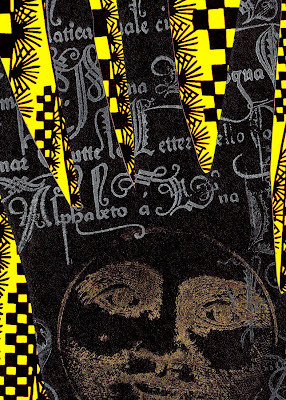 The background is a Dover image and rubber stamp (Moon) from Character Constructions. The script is also a rubber stamp (can't remember the source). I used metallic inks on black construction paper. This is my entry for this weeks' SPA theme "Vintage Children". 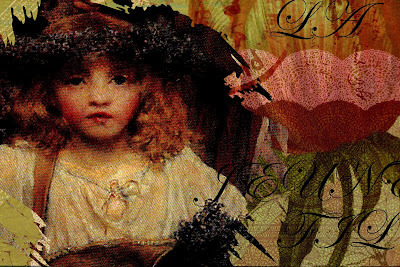 I used multi layers of artistic papers for the background and cropped vintage images to create this digital collage. I added digital Edwardian script for a real feminine feel. This is my entry for the TIO challenge where the theme is a "postcard tag". 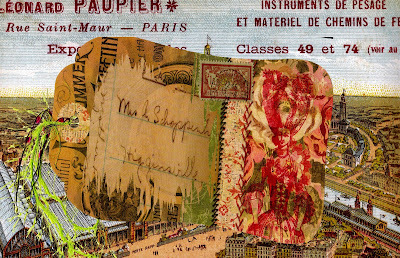 I created a tag using my Marie Antoinette stamp from (Character Constructions) artistic papers, postal (sticker) stamp and cropped and added text from a vintage post card for the effect. 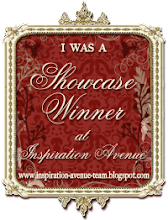 Background is a vintage image of Paris 1889 Worlds Fair. Lots of fun! 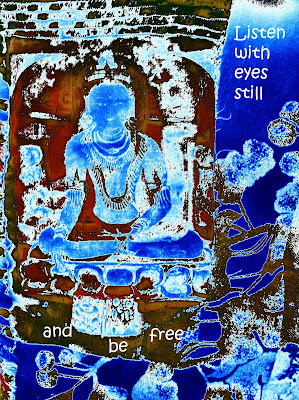 To make this digital collage I scanned in batik fabrics and an image of Akshobhya (the unshakable one). I added artistic filters for a burn -out effect and the text digitally. This is my fabric postcard for SPA challenge "Fabric". This is a photo of a section of an art quilt that I have been working on (forever) . 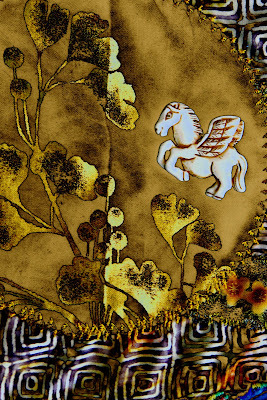 This section of quilt is made up of Batik fabrics (Andover), decorative machine stitching and an enamel flying horse piece that I found at a bead show. I love to sew but it is so hard to get into it in the summer. Once fall rolls around I will try to get back to it. I started this quilt long before I was blogging- so we'll see! 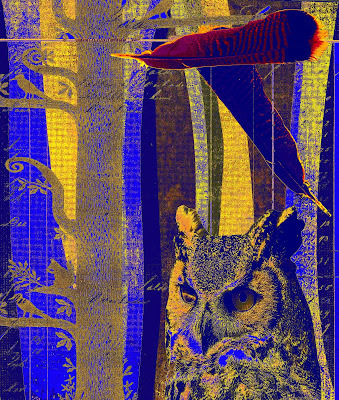 This is my entry for Inspire Me Thursday "Owl". 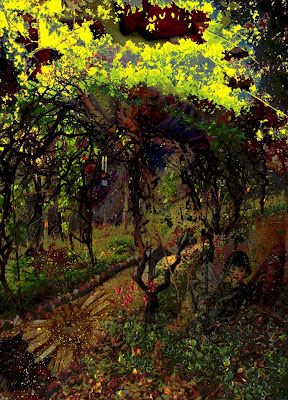 This is a digital collage made from scanned images with artistic filters. A great horned owl at twilight overlooks the forest. 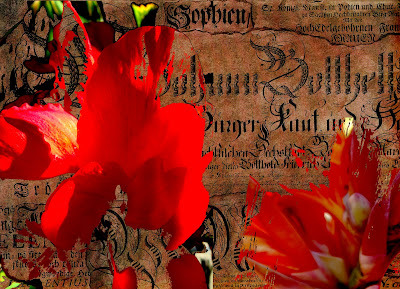 This is a digital collage made up from photos of some beautiful red flowering bulbs (can't remember the name!) that have bloomed in my yard recently. When I saw TGIF's theme of "RedFlowers" it prompted me to take some photos! There were some great shadows on the petals but the background was gritty so I erased it out leaving a hint of the display. This is my entry for The Three Muses challenge this week which is "Surreal". This was a wonderful challenge for me as I'm always trying to make "sense" of things and by the definition of surreal - things are dreamlike or non-sensical. 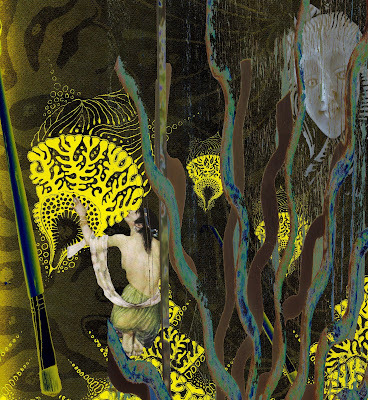 In this digital collage I tried to import elements that would represent an underwater dream world that is controlled and "painted" by a presence outside of that world. The woman appears a bit captive yet in awe of her strange but colorful world. When creating this piece it was hard to distinguish fantasy from surrealism and I really want to try to explore and work on this form of art expression some more . Totally fun! 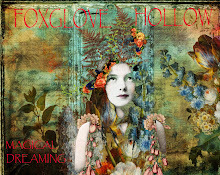 This is a digital ATC collage for TMTA "In The Garden". It is made from a photo of my grapevine trellis from my yard as the background and I added a page from one of my faerie journals. This is my entry for the Sunday Postcard Art challenge- "Nests". 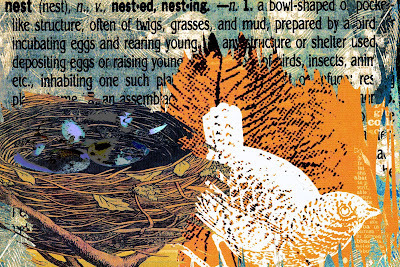 It is a digital collage made up from scanned AB decorative paper images, my photo of some quail eggs digitally altered and I scanned the definition from a dictionary erasing out the background. I got to thinking about "nests" per se and beyond the traditional definition, the word has a deeper and changing meaning in our lives. We leave the nest (fledge) when we are ready, we then (build )a nest for our own young , they leave us with an (empty) nest, and into our later years we build our nest (egg)-retirement. Kind of a wonderful full circle aspect of our lives! This is my entry for the Tag It On Challenge "Say It With Flowers". 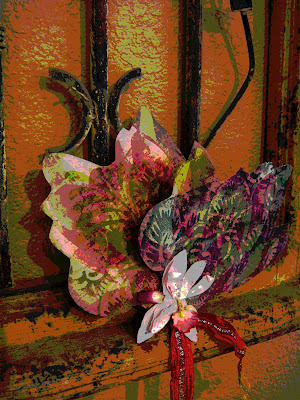 I cut out flower shapes from decorative paper and formed tags. I then rubber stamped (Martha Stewart line) fern images in mauve and peacock green inks. The background display is a decorative iron piece in my home. I added a posterized effect to this photo from photoshop for a painting/poster feel.